This jump start charger comes with a 12 amp-hour internal battery, is compact, and weighs 14-lbs. Though small in size it is capable in performing most operations and has an easy to read LEDs charge status: red indicating low charge, yellow indicating medium charge, and green indicating full charge. Integrated storage mounts keep the clamps safe. The size of the Schumacher PS-120A Mity-Mite power source unit has nothing to do with its capabilities. With its 12 ampere hour battery, this unit packs some power, making sure you’ll never be stranded by a dead battery again. Forget about flagging down a stranger for help or fumbling with unruly jumper cables, the PS-120A is a rugged jumpstarter that will charge your battery and get you back on the road. 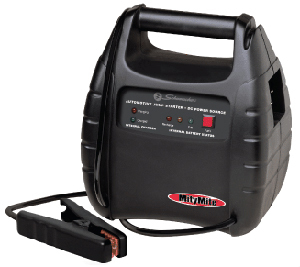 Compact, lightweight, and easily transportable, it gives you portable power anywhere. Plus, it still retains most of the same features as its larger brothers. The PS-120A gives you portable power anywhere. 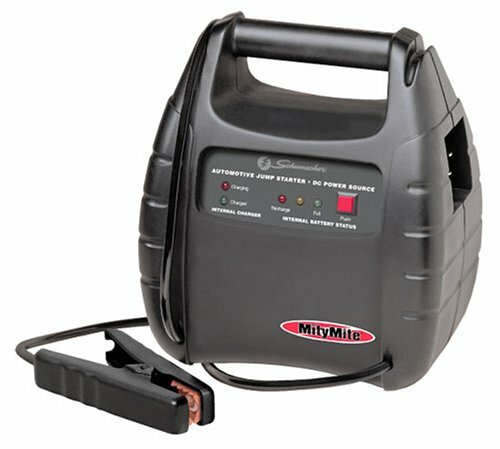 A little bigger than a lunchbox, the Mity-Mite consists of a compact 12-volt battery with attached jumper cables encased in a rugged portable plastic shell. It fits in your trunk, or in the back of your cab, and it even takes up little space in the garage. To revive a car with a dead battery, simply connect the Mity-Mite’s two cables to the battery terminals of the stranded car and turn the key. After providing a jump (or every few months, if stored), the unit should be recharged by plugging it into a wall outlet with the included cord. The display is comprised of easy-to-read battery status LEDs, which tells you when internal battery is at full power, 75 percent charged, or at 50 percent or less. A simple push of the button instantly turns on the display. The sure-grip, copper jaw, 200 amp, plastic clamps are designed for connecting to top and side post batteries. The #8 gauge, 18-inch cable stays flexible in the coldest temperatures. The LED indicator indicate whether the unit is in charging or charged mode to help easily monitor the status of the internal battery. Storage mounts on the back of unit keep the clamps in place for safety when not in use. Every Schumacher power source comes with a one-year limited warranty (90 days on battery).